My heart is grateful to the service men and women who've defended and ensured our country's safety. As a civilian career coach on the front line of helping people in transition, I recommend three strategies to consider as you design a job search campaign. 1. Carry on with motivation and confidence to land your new position. The military impressively trains soldiers for battle. They also prepare you with critical skills necessary for successful civilian employment. Today's employer needs professionals who work well under pressure, follow complex instructions, exert self-discipline, take the initiative and lead by quiet example. These core competencies are at the heart of a soldier and vital to a successful business. The key to a successful job search campaign is the ability to exert a strong force of motivation in your daily job search activities. If this energy equals your high mastery of skills, confidence to land the job will become stronger by the day. Searching takes time and is a full-time mission. To discover and convince the right employer for you of the many skills you offer requires resolve and determination. Stay focused on being the solution to the employer's problem. Reconnaissance of labor market information where you want to work can empower every conversation and interaction as you translate combat skills into the business lexicon. Start the process with a daily action plan including small steps to accomplish. Connect to people each day to give you a continual boost of momentum to carry you. 2. Look up when change seems overwhelming. Change is the most consistent process of life. The loss of military's day to day structure and organization makes room for new ideas to be born. Listening to a retired officer describe his anxiety of having too much time on his hands was palpable. He wanted to work and contribute but was paralyzed by not having a routine and direction. It is easy to feel overwhelmed by too much time to think without a clear plan to act. In the vortex of change, discouragement sets in when thoughts and feelings block action steps to move forward. Remember every closed door eventually leads to an open one contingent upon motivation remaining high. Every civilian job-seeker receives (at minimum) ten to fifteen rejections before they hear "you're hired." The job search requires great mental stamina. Look up each day with a resilience and determination to explore all possibilities until your mission is accomplished and check off every "no" you hear as one step closer to the "yes" you will be offered. 3. 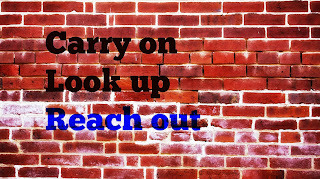 Reach out to civilians who are by your side. Enlist the assistance of family, friends and colleagues to support you through the job search process. 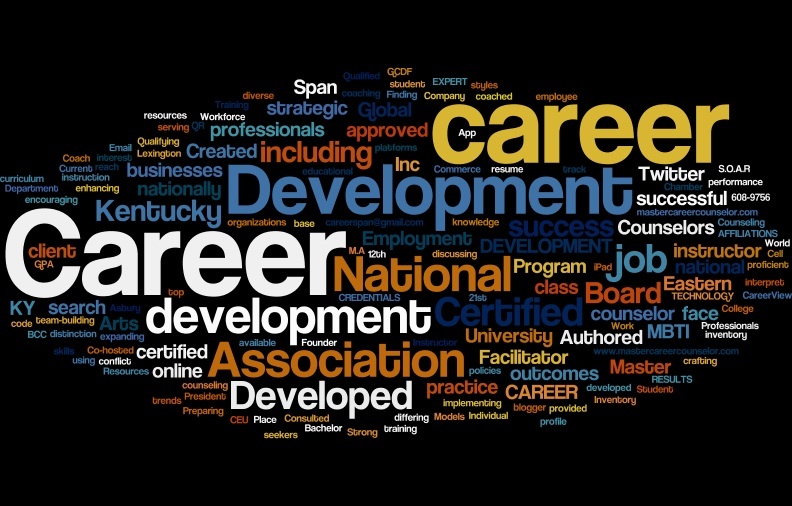 Master career counselors (MCC) certified by the National Career Development Association can help craft a targeted resume, prepare for an interview and utilize job search strategies that yield results. Your job offer is likely to come from a secondary source of contact from the primary relationships you've built. This includes the friend of a family member or a brother of one of your high school classmates. Expanding your interpersonal connections will broaden the scope of available opportunities you would otherwise not know. The process of finding civilian employment happens exponentially faster when you carry on each day with motivation and confidence, look up when discouraged and reach out to others for support. What effective strategies would you add? Suggestions welcomed. Do you want to see the cornerstone words your resume is built on? Have you taken a moment to see the word cloud of your professional expertise? Wordle is an effective and fun career tool to discover the patterns of your experience using the text of your resume as the generator for creating a word cloud of your skills. 2. Click on the link "Create your own." 3. Copy and paste your resume text into the box. 4. The word cloud is automatically generated. You can change the colors, font or scheme of your resume word cloud. It is a great exercise to determine patterns of the words used in your resume and skills you are building in a consistent progression. What's in your resume word cloud? Mine captures what I enjoy most: helping others develop a meaningful career. 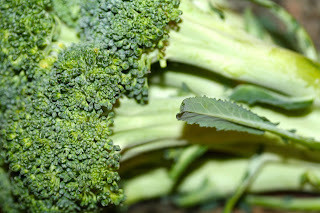 Broccoli, is a vegetable clinically proven to keep our bodies healthy. Rich in cholesterol-lowering vitamins, broccoli also reduces the risk of breast, lung and colon cancer. The more you eat it, the more likely you are to enjoy a healthier life. We can all agree, this leafy green vegetable provides amazing benefits. But let's face it, broccoli STINKS when you cook it. Just the other day, my kids declared the after-dinner odor as intolerable. To minimize the foul residue we lit candles as though the house lost electrical power. How can something so good for you smell so bad? Similarly, life's obstacles are proven to keep our life priorities in order yet like cooked broccoli, it stinks to experience loss, challenges and difficulties to overcome. Our choice and resolve to face difficulties with a hopeful attitude can lead to wiser choices and a greater sense of what really matters. Life's troubles do smell like cooked broccoli, yet also bring out the best in us if we let them. The challenges we face such as losing a job or experiencing great disappointment are rich opportunities to strengthen us. When life presents the "cooked broccoli" moments that stink, remember the benefits it provides if you allow it. And don't forget to light a candle. The highly important question I pose to the unemployed college graduates seeking my services as a private career counselor is a pivotal catalyst for rethinking work. A major reason for their initial visit can be linked to a parent who discovered Career Span when they typed “desperately seeking career help” in a search engine. For me, questions are the platform to engage young adults in meaningful dialogue as they prepare to enter the workforce. From each individual response, strategies can be developed and action plans implemented to equip them with sustainable skills for the future. Questions by their very nature provoke conversation. 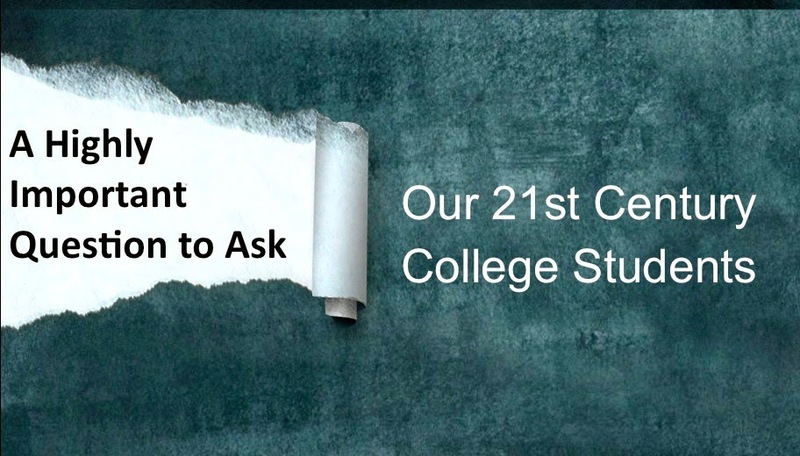 If asked in a non-defensive, non-judgmental way with an open posture of acceptance and rapport, questions help students investigate, explore and better understand the importance of being intentional and thorough in their planning and preparation for professional success. The National Center for Education Statistics (NCES) projects 1,855,000 students at the bachelor's degree level will graduate as the Class of 2015. 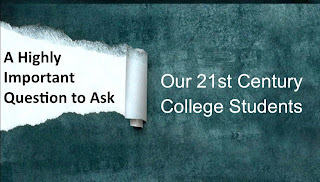 A 2013 report released by the Center for College Affordability and Productivity found that the number of college grads will grow by 19 million between 2010 and 2020, while the number of jobs requiring that education is expected to grow by less than 7 million. Suffice it to say, graduating seniors are entering a job maze of great challenges. They face significantly lower wages than they anticipate and the average worker's salary hasn't significantly increased at the same rate as our cost of living expenses. To strengthen this reality, a recent report by the Economic Policy Institute, indicated entry-level wages for graduates are expected to be no better than they were 15 years ago. What will make the difference for students to successfully land a job offer rather than remain unnoticed as a perpetual jobseeker? How can we educate students on how to negotiate and achieve a job offer representing the fair market value of their skill set? Students pursuing co-op opportunities or internship experience during their collegiate years, position themselves above and ahead of their peers. In addition, when those students engage in meaningful dialogue, this highly important question can help brace them for a fast changing, agile and turbulent job market. What does the word career mean to you? Do you know the word career is now transforming from a noun to an action verb? A career is defined as “an occupation undertaken for a significant period of a person's life and with opportunities for progress.” Today “a significant period of time” now means an average of three years or less in a particular work role. The average worker changes jobs at least 10 to 12 times. Most of us are doing work today that wasn’t written in the job description of our original offer. Such is the 21st century workplace of shifting paradigms related to emerging business strategies, new products and services for a consumer base whose demographics constantly change and trend. Add that to our surging global market with innovative technology creating a complex revolution of the workplace and those who work in it. Using the word career as an action verb indicates we are willing, open and adaptable to the force of change and the impact it will have on our work life including the processes, systems and organizational structure we put into place. The noun career is derived from the French word that means “racetrack”. You know when a career becomes just a job. It happens when we believe the racetrack just goes round and round with no finish line in sight. When we see the word “career” as an action verb we run the race with endurance, strength, fortitude, cooperation and the wisdom of professionals who go before us. Especially, when change happens. Change is the most consistent thing in work and life. How are we preparing our future workforce for the inevitable turbulence they will experience? Keep in mind; we cannot prepare our students for change we’re not prepared for ourselves. Therefore, we must also ask, how are we preparing for the same turbulence that may occur in our work? 1. Be intentional about gaining experience and proving its value. 2. 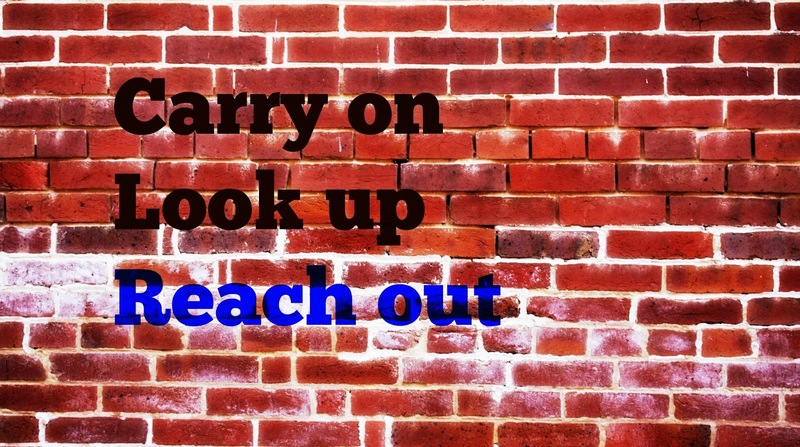 Have a mentor to guide them through career exploration and the job search process. 3. Connect to a vast array of employers and industry experts while learning best practices for their chosen profession. Today, career as a noun is no longer a one-time decision determined in college, but an intentional process of making wise choices when it comes to work opportunities. Students need to be empowered to see work not as a ladder to climb but as a trellis to support their professional and personal goals of achievement, growth and contribution. If we don’t ask them this highly important question of how they see career as an action verb or challenge their views if they only see it as a noun, students are likely to stray off the narrow course and continue to run in circles. What is another highly important question you would ask? To fully understand this blog post, it might be helpful to read the previous one about how the noun form of "career" must become a verb to be successful in your work. To career your career is another way of saying it. Today's job market demands an intentional posture of developing and growing your skill-set. 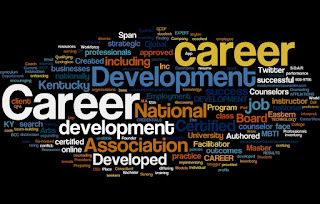 When you are in the process of learning, you are treating the word "career" as a verb. When you think you know everything, you've reverted it back into a noun. To say you will have a career in ________ in today's 21st century world of work can never be based solely on your knowledge or expertise. Career in our new work paradigm is not only what you do but how you direct, own and are responsible for your work success. Career is the active lens by which you view life and work in the midst of constant flux and radical change. To career your work life means developing skills that aren't easy to quantify. Experts have called these abilities "soft" skills. They are anything but soft. They are the hallmarks of solid careering in a work world you can never treat as a lounge chair. If you don't career, you will certainly careen. Even when you do excellent work. "I worked 18 years with excellent reviews. I don't understand why they let me go. I am devastated." "I've given my employer everything. I worked late nights without pay, given extra time in the office on weekends. I was employee of the month last year. I can't believe when my team was reduced they included me in the layoff. Now what do I do?" In the next post, we'll look at ways to career so you won't be susceptible to the careen. Careening occurs when you are forced to lie over on the side of the road of employment because you had no idea the gust of change would blow so hard your job buckled under the weight and you didn't even know what was happening. The solution to this problem is straightening the path of your expectations of what a career is. 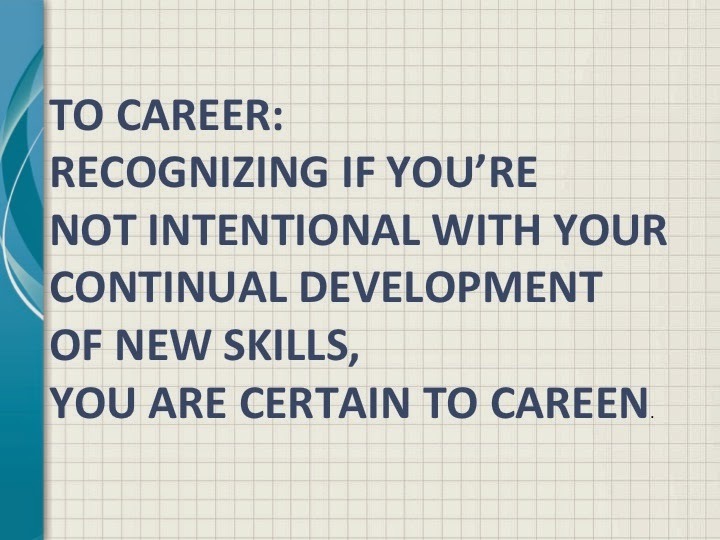 If only we could empower our students to understand what career readiness truly means today.